Fernando Haddad is making a last-ditch effort ahead of Sunday's runoff election to win over Brazilians who in previous elections cast ballots for former President Luiz Inacio Lula da Silva. The left-leaning Haddad announced Thursday he will visit three states in Brazil's impoverished northeast, which is a stronghold for his Workers' Party, and finish Saturday with a rally in a Sao Paulo slum. Polls say far-right congressman Jair Bolsonaro leads Haddad by more than 10 percentage points â" aided by some voters who once were supporters of da Silva. The northeast might be Haddad's best bet for making up lost ground. The region is home to almost 40 million of Brazil's 147 million voters, and is the only place where Haddad leads Bolsonaro. Sao Paulo slums also backed da Silva in previous elections. "It is important to have a connection with the poor," Haddad said at a news conference. 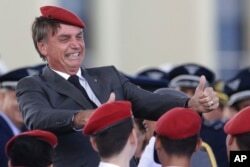 FILE - Presidential hopeful Jair Bolsonaro flashes two thumbs up as he poses for a photo with cadets during a ceremony marking Army Day, in Brasilia, Brazil, April 19, 2018. Haddad, hand-picked by the jailed da Silva as the Workers' Party candidate, will visit three northeastern states governed by allies. Campaign manager Emidio de Souza said Haddad will also try to lure moderate and evangelical voters in the final days before the election. "Many voters decide in the last few days, and they see the risks of a violent, authoritarian Bolsonaro administration. There is still time," ; de Souza said. Earlier, Haddad met with members of a mission from the Organization of American States that is observing Brazil's elections. Former Costa Rican President Laura Chinchilla, who heads the mission, said the spread of false news via the WhatsApp messaging service during Brazil's campaign is unprecedented. "It is the first time in a democracy that we are observing the use of WhatsApp for massive sharing of fake news," she said. Haddad has repeatedly accused Bolsonaro of bankrolling a fake news campaign against him. Chinchilla said the front-runner has yet to accept an invitation to discuss Brazil's election with the OAS mission. "We want to stress the importance that the vote in the runoff be rational, informed and not moved by many of the feelings coming from false news," Chinchilla said. On Thursday, a Datafolha poll said Haddad had gained a little ground against Bolsonaro, though he still tra iled by double digits. Haddad's support rose to 44 percent from 41 percent last week. Support for Bolsonaro declined to 56 percent from 59 percent. Datafolha interviewed 9,173 voters Wednesday and Thursday. The margin of error was two percentage points. At a Thursday news conference, Bolsonaro backed off his pledge to take Brazil out of the Paris climate accord if he wins the presidency. He said he could discuss terms if Brazil's sovereignty is assured. Asked which terms of the agreement could hurt Brazil's sovereignty, Bolsonaro said: "This is information that I have and that are real. Obviously, for how big they are, they are not revealed." A TV debate that had been scheduled for Friday was canceled after Bolsonaro declined to take part, as he has done since he was stabbed at a campaign rally Sept.6. General Augusto Heleno, an ally of Bolsonaro, said in a video that the decision was due to a "terrorist plot" aga inst the candidate, though he gave no evidence.